The UNO Mavericks are headed to the Frozen Four! I also have no idea how to talk about hockey. It is fun, I love the Mavericks hockey program, I have been to a couple NHL games, I know all of the rules and I reffed floor hockey and was pretty good at it (yes I know they are two different things), but in the end I do not know what makes a good play a good play unless the puck goes in the net or the UNO goalie stops the puck from going in the net. The first hockey game I ever went to, the student section friended the opposing players on Facebook and found pictures of them drinking at a toga party, and the UNO students printed off giant posters of the pictures and held them up at the game. It was brilliant. There is a Wisconsin native and Badger sport fan that I work with that was going on and on about the Final Four, and I said “big deal, is Wisconsin going to the Frozen Four? Nope.” He then shut up and went away, it felt great. He also did not seem to thrilled when I talked up UNOs win over Marquette in basketball, or the women’s win in Milwaukee. Okay, so that is about all I can say about hockey, and since only about 6 of you are regularly reading this anyway, I thought I would take a different route, a restaurant review! Many UNO students know about what Aksarben has to offer from DJ Dugout to Voodoo Taco, they know all the great spots down there. There is one fine little restaurant near campus that I feel gets overlooked, and that is Three Happiness Express, just on the other side of Elmwood Park on Leavenworth. The name is weird, and it is small, but the service is great and the food is delicious. When you sit down you feel like you are in a small cafeteria, and the staff will find you within a minute and welcome you and ask you what you want to drink. They will hand you a menu and then you have a little time to answer three basic questions: What entree would you like? Hot and sour soup, wonton soup, or egg drop soup? Crab rangoon or eggroll? If you answer the questions before even being asked, you will instantly feel a bit of confidence about yourself, which is good because you are about to fill yourself with a bunch of carbs and calories. Calories are energy or something like that. If you are like me, you live by a simple rule when going to Chinese restaurants. That rule is: you always order sweet and sour chicken with sauce on the side for your first time at a Chinese restaurant. Why have this rule? It is the most American thing on the menu and you will feel like a 6 year old eating chicken nuggets while your parents eat a real meal. The reason I do it though is that I feel that is the audition for Chinese restaurants. If you screw up this simple meal, then what good are you? If you can impress me with this meal, then I will come back. There is a small Chinese restaurant at about 108th & Q streets, they failed the audition, the grossest I sweet and sour chicken that I have ever had. Three Happiness nailed it though. The soup is great too, I always order the Sweet and Sour Soup, I just wanted to let you know a little more about me. My friends all seem to prefer the egg drop soup, I have a couple that always throw in ice because they cannot handle the heat of the egg drop. So basic… but it is cool because I can make fun of them for the duration of the meal. My friends and I have never had any complaints about Three Happiness. None of us really live near UNO anymore, so after a while of not talking as much as we should, someone will send out a group text of “Three Happy?” and then we are all on board to meet there. You can even get a cute little card that says you will get a free meal after you have eaten 10 meals there, which is a reward in itself. Elaine Benes knows what it is like to get that food that you earned. I have a friend that went to college at UNL and I took him to Three Happiness, and he said that he thought this should be a popular place for the UNO students. It definitely should be. One semester for Finals week, I took my books there and ate Chinese food by myself and studied my material. The staff was incredibly supportive, and they would try and keep my food away from my books. They even whispered to me, which was not helpful really, but it was still a nice thought, they were just looking out for me. Once you they have passed the Sweet and Sour chicken audition, there are many more dishes that are satisfying. 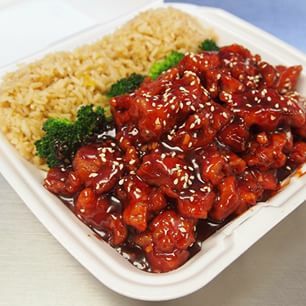 The sesame chicken is my favorite, it is just perfect and I have yet to find a place in town that compares. The chicken fried rice is superb, but how many restaurants can honestly mess that up? But if you want a Chinese meal without a bunch of sauce, that is always the perfect way to go. Anything with shrimp is pretty good too, I am a big fan of shrimp, but I normally do not trust Chinese or Mexican restaurants with shrimp, and by Mexican restaurants I mostly just mean Taco Bell. I once ordered the orange chicken at Three Happiness, I meant to say sesame chicken but for some reason the word “orange” came out of my mouth, and I am not one for orange chicken but I still thought it was fantastic. Seriously, like, how are you still here? On a scale from Creighton to UNO (Creighton being the worst and UNO being the best) I definitely give Three Happiness an 8. The scale is also -2 to 10. I am pretty sure they have won a Best of Omaha award too, but I could be making that up.